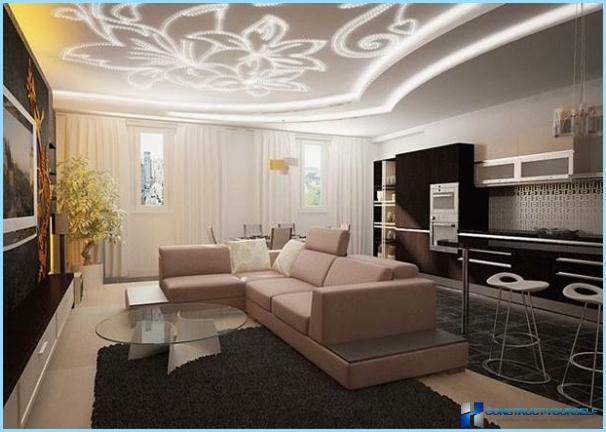 Design of the ceiling in the living room made to pay specialAttention. In the hall on the walls of any flaws and defects can be hidden or decorate. Modern floor coverings have become such that they are hard to mess up, at least on the floor you can lay something, say mat patchwork technique. But with the ceiling so it does not turn, the defects can not hide it, and they will be constantly visible. Especially because in the living room you accept guests, and his first glance, they inadvertently drop ceiling. It is interesting to look at the background of our country's historyon the metamorphosis undergone by the ceilings in the apartments. The "accursed tsarist times" their richly decorated with stucco and whitewashed. In the first years of Soviet stucco was still, but slowly began to fall off, and in the buildings of the Stalin era moldings left only outlet in the center under the chandelier, and a border around the perimeter. Do not forget that in these homes are the best apartments of the era. During the mass housing moldings sunk into oblivion, simply whitewashed and mounted chandelier - one of the symbols of wealth in Soviet families. Suffice it to recall a scene in the movie "Mimino", when in court trying to find out the cost of a broken "falcon" Kikabidze chandeliers. History is cyclical, including the history of design. 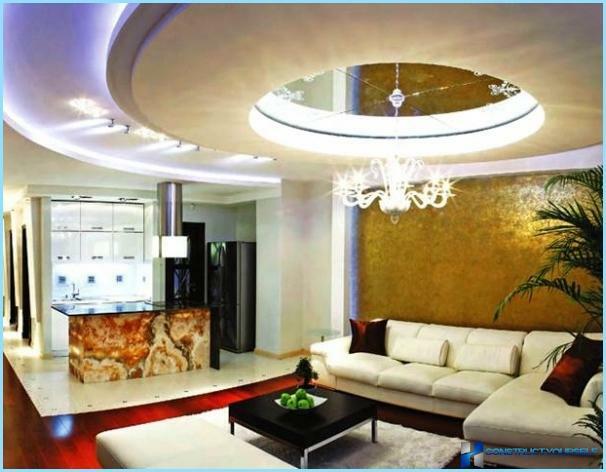 It has been a century, ceiling regained its focus and become a full-fledged subject of the interior space. Very important! 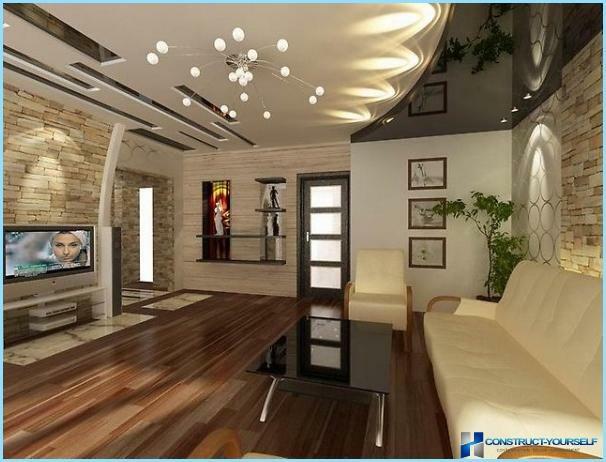 Mandatory requirement today - Matchceiling decoration style living room with style. 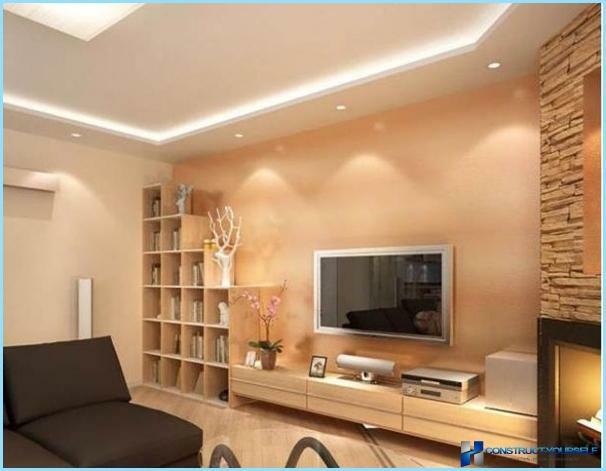 After all, it is not just about one of the surfaces in the room and the placement of basic lighting. 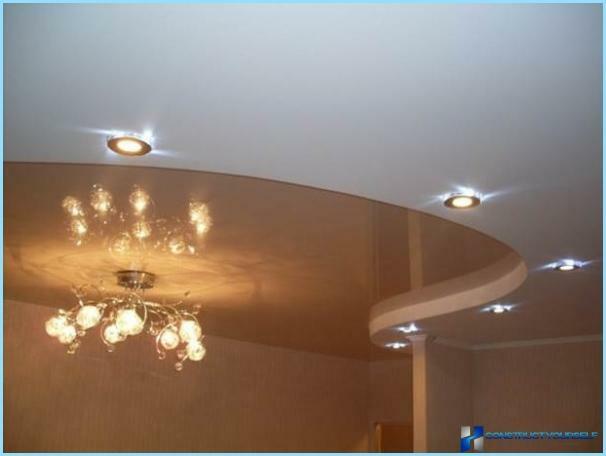 Ceiling - This is a very important part of the interior living room (and every room in the apartment), which is also assigned the function of visual increase in space and its zoning different in their functional areas. For this purpose, materials are selected and finishingdecoration, design is chosen, its configuration and lighting system. 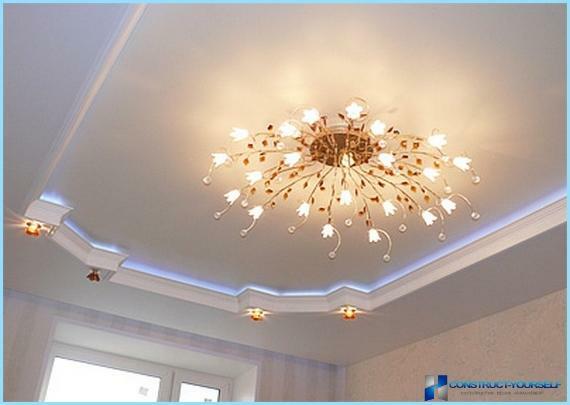 Yes, it is the combined lighting system, because one chandelier, no matter how beautiful and stylish it is, can not solve all the design challenges for lighting the room. 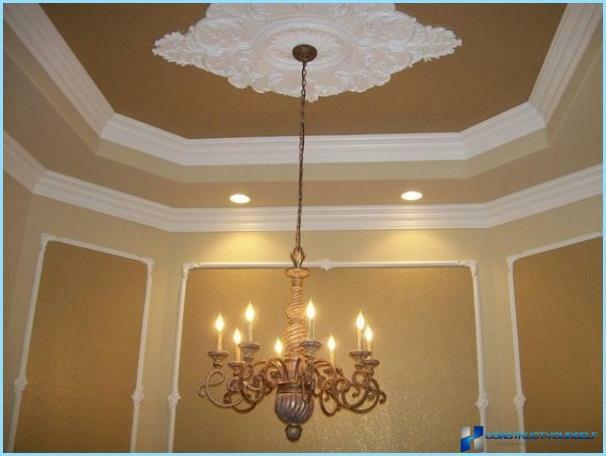 For single-layer device ( "flat")use ceiling paint, tiles to the ceiling, wallpaper, decorative plaster, wood. Single-level can also be suspended construction of the drywall or suspended ceiling. Two- and multi-level structure made ofsuspension systems, lined with plasterboard, drywall, and combinations of multi-level ceilings with tension. 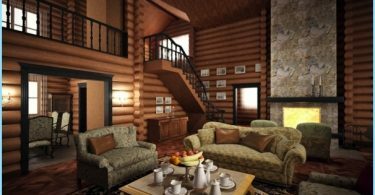 Complex structures can be created with natural wood beams or products from expanded polystyrene, which imitate wooden beams. 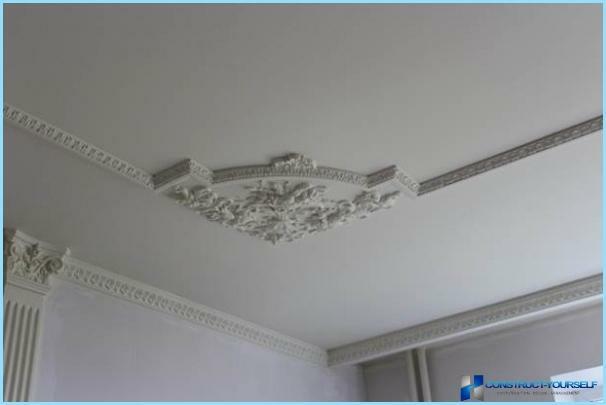 For decorating the surface using plaster or polystyrene moldings, moldings. To say that the single-level ceiling - itbanal and boring solution, completely wrong. 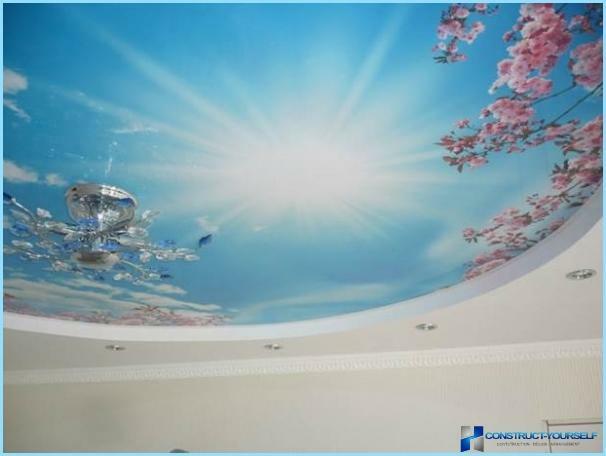 The aesthetics of the ceiling does not depend on the number of levels, and the quality of materials, craftsmanship and thoughtfulness artist design intent. 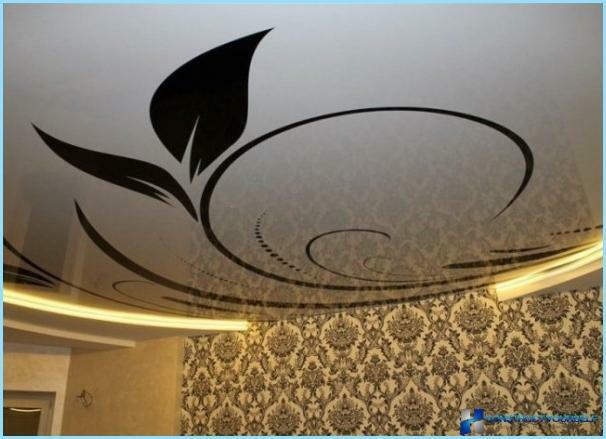 You can give an example: sticked on the ceiling plain faded color wallpaper will look presentable. 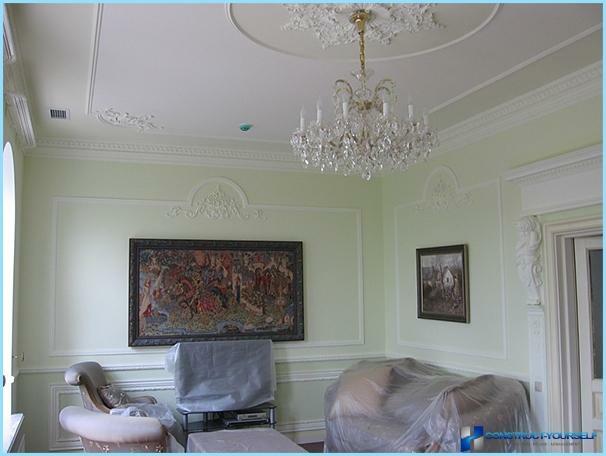 Beautiful embossed wallpaper (non-woven, fabric or vinyl), glued into the frame of the molding will look very different. 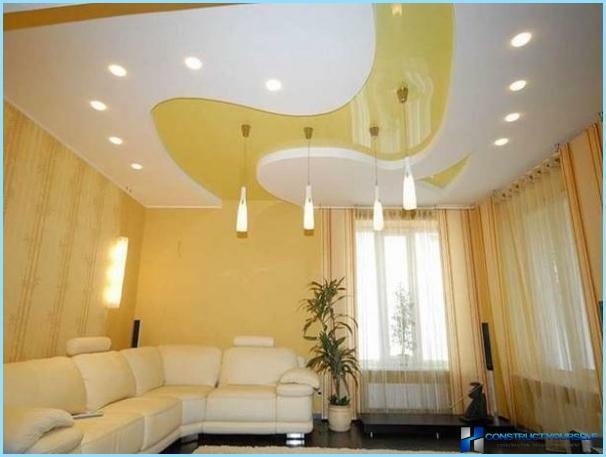 decor - this is not the ceiling, the ceiling remains the single-level, and the means for its decoration. 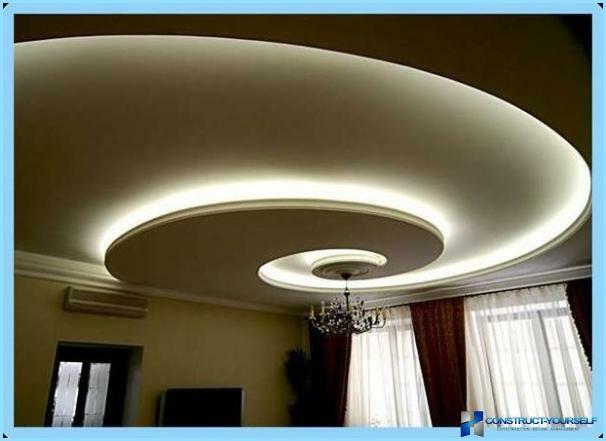 Moreover, it can not be called boring one-tierconstruction of plasterboard with a well-thought-out lighting and decorative elements, or suspended ceiling. 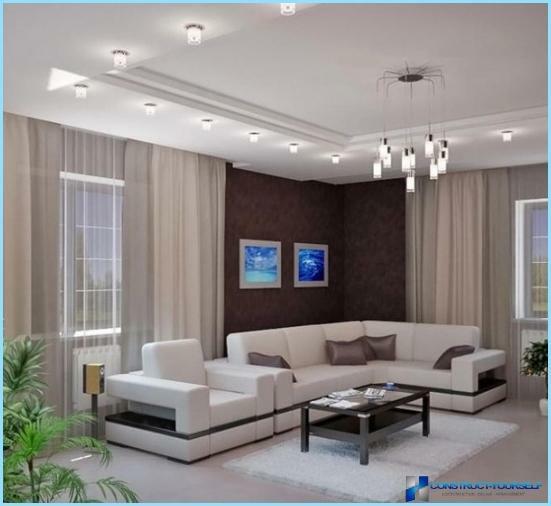 Although, no doubt, a multi-level design provides much more opportunities to make the entire interior design living room originality and elegance. Sharma and charm, if you will. Important! 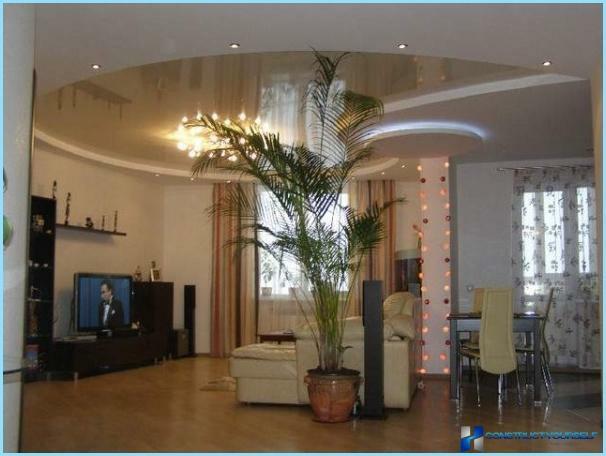 Multi-level design are appropriate in the living room withceiling height of 2.50 meters. If the height is lower, you should carefully consider the configuration of the ceiling structure so that it is not "pressed" on being in the living room. Or quite give it up in favor of a more simple design that will better match the height of the room. The assertion that the "top" must necessarily bewhite or very light, is not an axiom. It can be anything. Even black. 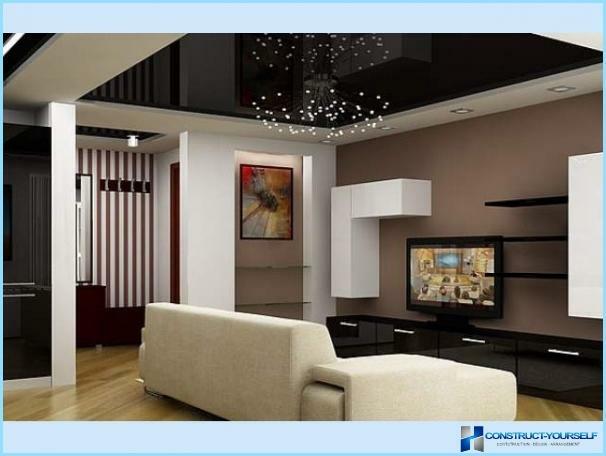 Glossy black stretch ceiling and stylish looks perfectly in the hall. 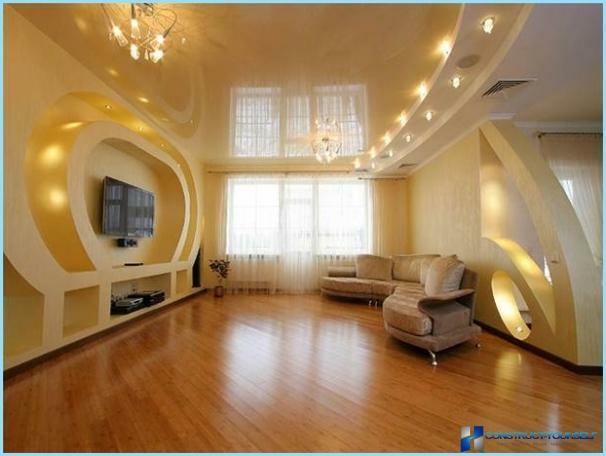 The main thing is to match the style of the living room. 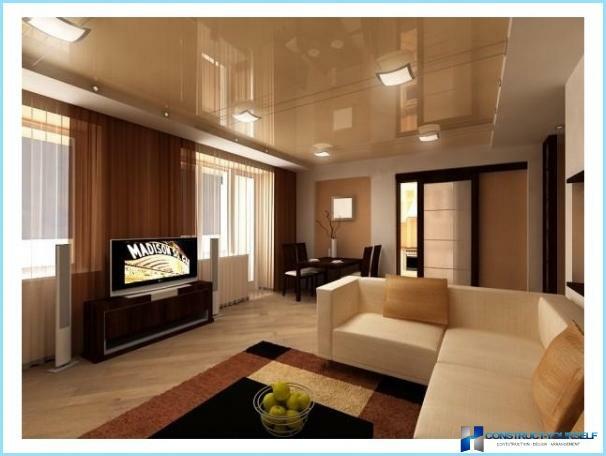 However mat ceiling the same color look in the living room will still gloomy. 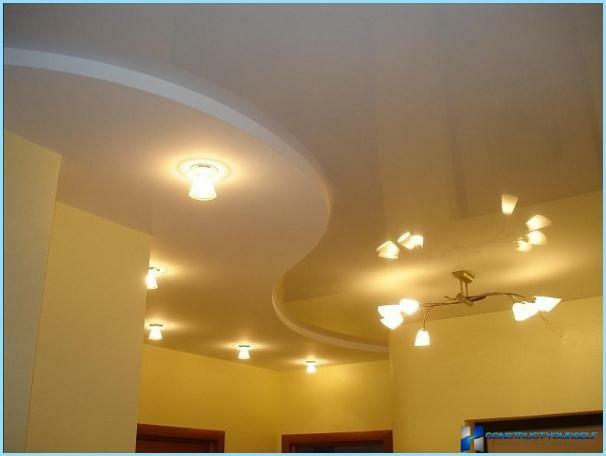 suspension structure in appearance fromdrywall is often difficult to distinguish from the matte white stretch ceiling. Not such different designs and capabilities. This is one reason that quite often they are combined together. Hanging drywall constructionsCompared with tension ceilings require considerably more time for assembly and finishing. 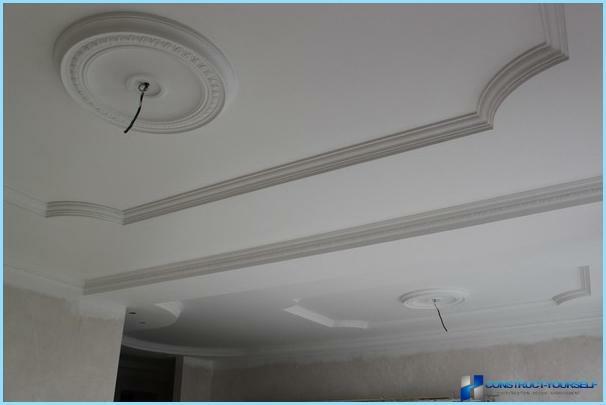 Plasterboard unlike the most popular material of suspended ceilings - PVC film, water resistance does not possess and after contact with water becomes unusable. Important! 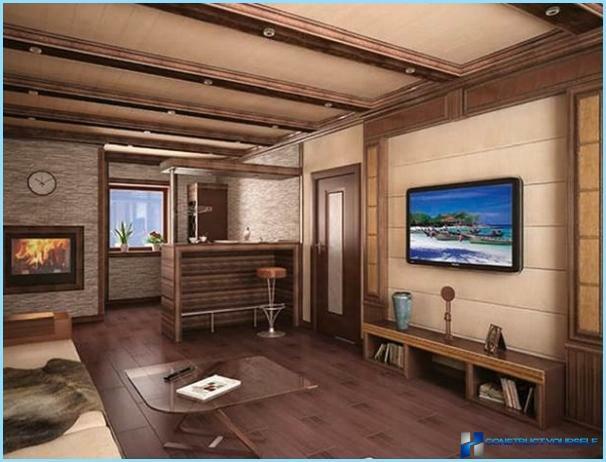 However, the indisputable advantage structuresplasterboard lining - the ability to create multi-level ceilings with different lighting systems. Another advantage is the ability of plasterboard lining its virtually any material. 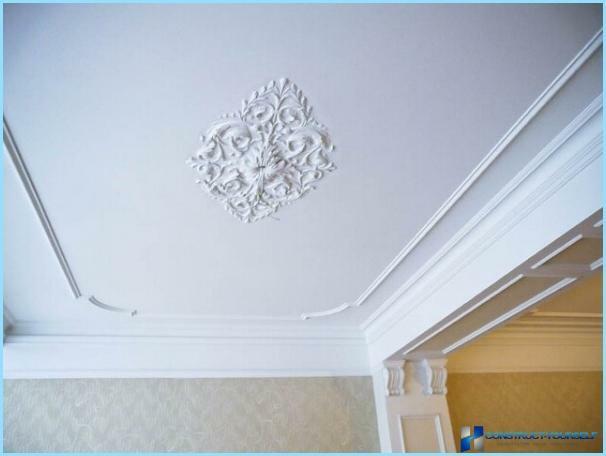 In addition to traditional painting, the surface of this design can be decorated with decorative elements, make mirror inserts, apply a decorative plaster to highlight certain areas or use the reception, which is called "capture the ceiling." 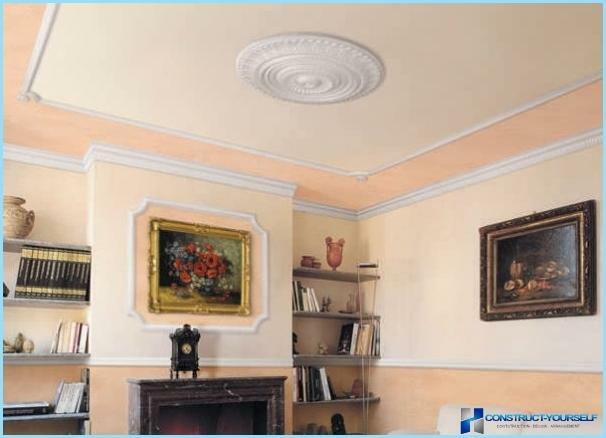 In this case, part of the ceiling surface is coated with the same material as the wall surface, and the transition is not allocated. 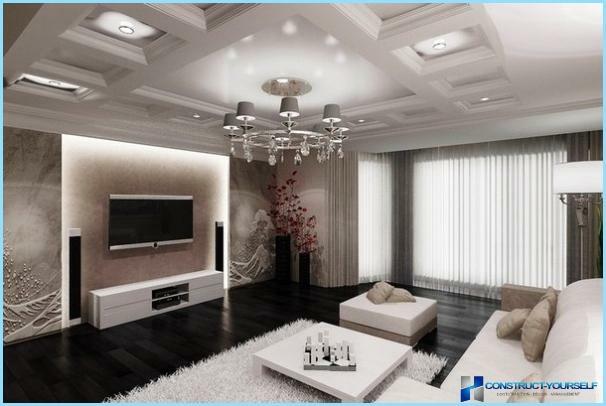 Multi-level structure allow to organize different lighting for different areas of the living room or accent lighting with the help of some home furnishings in the room. By type of surface are matte, glossyor satin. Available in one color or a pattern applied by printing. 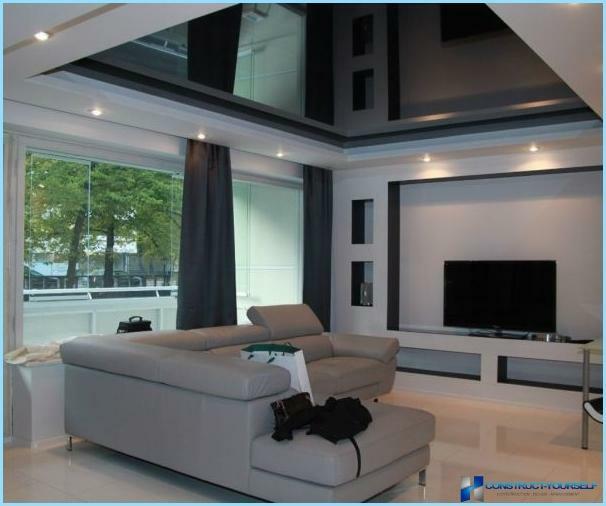 By type of material different ceilings of PVC film and fabric made of polyester canvas. The first type of affordable, well tolerated serious leaks. 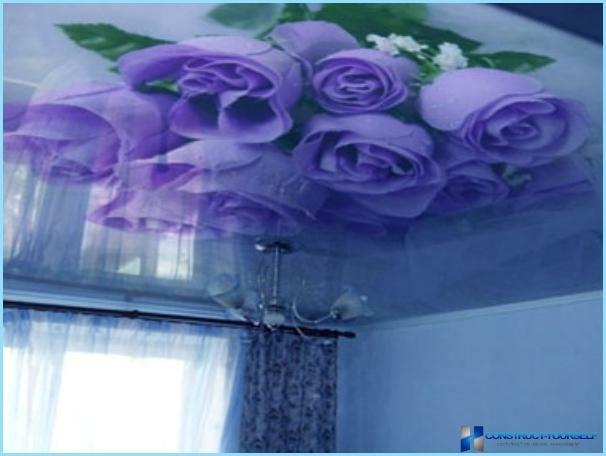 Cloth PVC film does not exceed the width of 2 meters, so the installation welds are made (they are practically invisible). For the installation of ceilings require a heat gun. 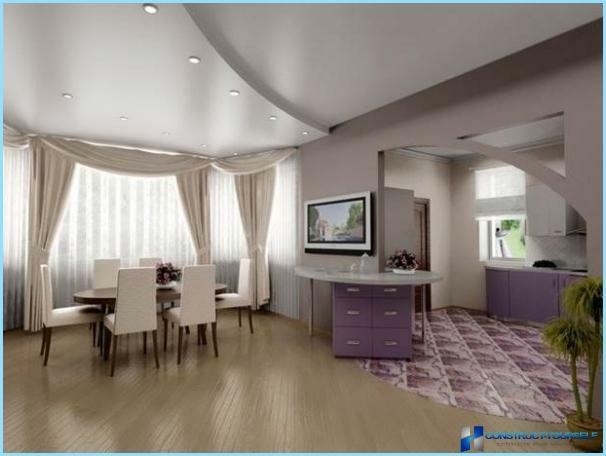 Fabric stretch ceilings are installed without seams,because the web width is 5 meters. In the manufacture of textile fabric impregnated with polyurethane that protects the canvas from moisture. 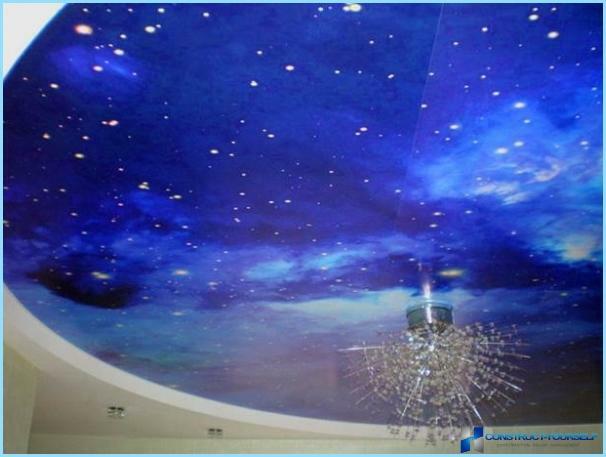 However, the ceiling cloth is smaller in comparison with PVC film elasticity. 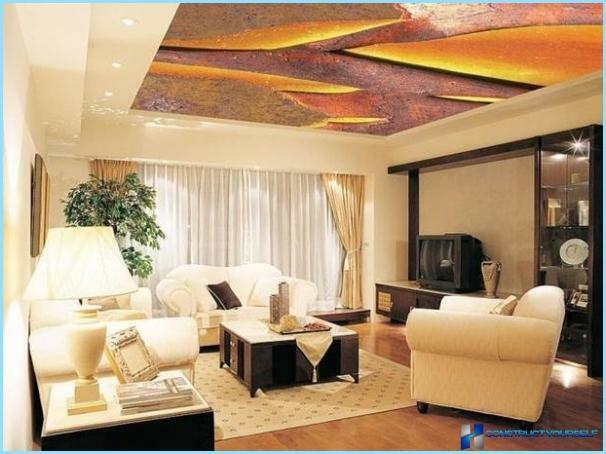 For the living room with a small height recommendedglossy ceilings. They are capable of much, up to two times, visually "raise" the room. Even very dark or black glossy fabric due to this effect, will not have a man in the oppressive living experience. Selecting colors and designs so great thatstop at one thing is quite difficult. Apparently, so worried and tormented Soviet man caught at the end of the restructuring of the "bezkolbasnoy" Moscow for the first time in the sausage department store German or French. Mandatory presence of a central lighting fixture. Mandatory presence of a central lighting in cases of clear zoning living. Mandatory lighting spotlights around the perimeter of the ceiling structure. 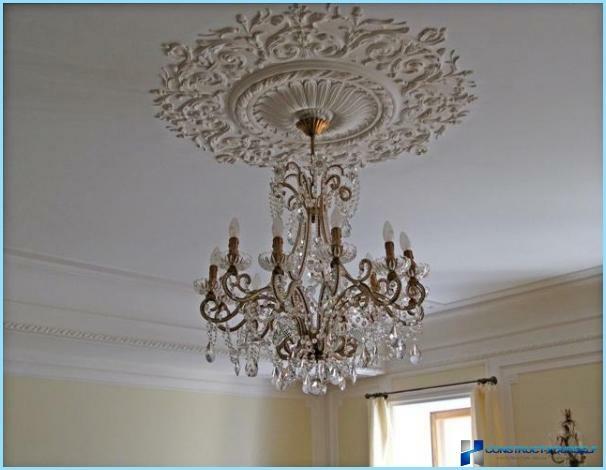 For the organization of lighting usedClassical and modern chandeliers, spot lights, LED lights. 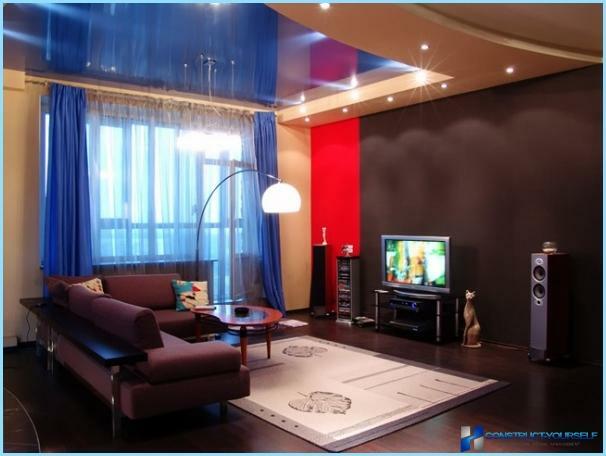 Material and type of fixtures are selected in accordance with the design style of living.